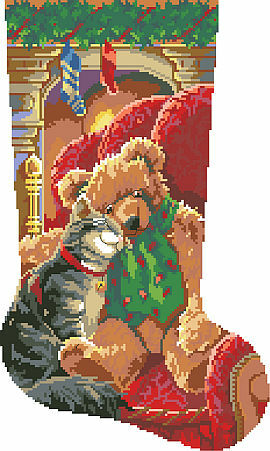 Christmas Cuddles is a classic stocking that will warm your heart. An adorable tabby cat cozy’s up to a toasty teddy bear sitting on an armchair by the glowing fireplace is an unforgettable Christmas scene. This is one of our most requested heirloom stockings.